What do you do when you can't finish your huge bunch of bananas before they go all spotted and browned? Just a small tip: If your banana is getting too "spotty" and you aren't going to bake the banana bread until a few more days later, PEEL the bananas first, then dump them into a ziplock bag and pop them into the freezer. When you're ready to bake, just take them out and thaw them out. It'll be alot easier to mash after they're frozen-and-thawed too. 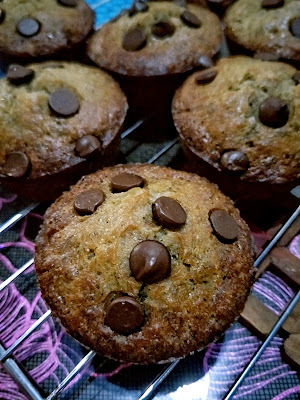 So, following Genius Kitchen recipe for a standard loaf of banana bread, I made some tweaks here and there to get 7 (small) banana bread muffins of about 152 kcals each (calories for that 6 mini chocolate chips on each muffin NOT counted). 110g castor sugar equivalent of zero calorie sweetener. First up, mash up your bananas to your preference. If you prefer to still have small chunks of bananas in your muffin, then mash them up until you still have bits of banana flesh left. If not, just mash them up until they're like fruit puree. In a clean bowl, cream your soften butter and sugar substitute until slightly pale and fluffy. Creaming your butter and sugar substitute will give you a more tender, cakey texture. If you'll prefer a denser, heavier banana bread muffin, use melted butter instead and no creaming is required. Then, beat in your egg and mashed banana until well combined before adding in the dry ingredients and folding until just combined. Never, ever overmix the batter or you'll end up with rubbery and tough banana bread. I know it's tempting to keep mixing when you see your batter still extremely lumpy, but that's how it should be. Your banana bread will be a flop if you end up with a smooth looking batter. Next, divide your batter into 7 muffin cups, or 6, if you prefer a bigger muffin with the distinctive muffin top. As a form of calorie-control, I chose to shrink my serving size and ended up with more of a cupcake (just a slight dome-top instead of a spillover muffin-top). Sprinkle topping of your choice over the batter (or skip it if you prefer, as the muffin itself will be sweet and tasty enough on its own) and send your muffins to bake in the oven at about 180 degree Celsius for 17 to 20 minutes, or until a toothpick inserted comes out clean. I checked mine at 15 minutes and found just a little bit of wet batter on the toothpick and then left them to bake for another 3 more minutes, checking every minute to make sure I don't overbake my muffins. Remember, an overbaked banana bread muffin = a failed banana bread muffin! 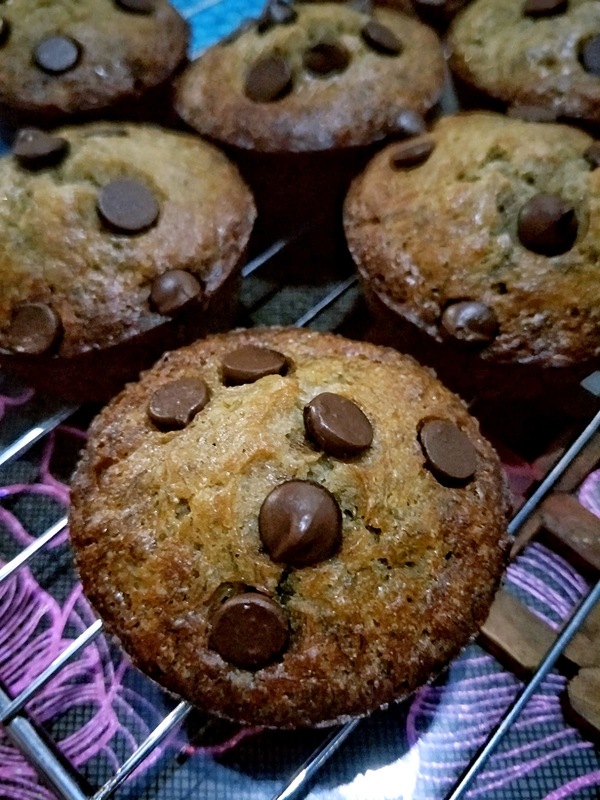 These muffins are slightly cakey, extremely moist and much lighter (in texture) compared to those typical dense and heavy banana bread (made with melted butter). Usually my bakes can last us for a few days (as my family really aren't a fan of sweet treats and baked goods in general), but these muffins just disappeared miraculously within 24 hours.